Pigs to be slaughtered are relaxed by warm shower, and then they will be driven to the Electric Anaesthesia through the pig-driving path and turn fainted. Lifted by the foot-harnessing chain, pigs being killed and blood let will first enter the scalder to be scaled out and then to the shaver for shaving. The already shaven pigs will be punched holes in their legs on their conveyer, and then lifted to the track. Being processed from the pre-drying machine, singeing machine and black-scraping and polishing machine, the pig carcasses will directly enter the white pig cutting automatic line, and the red and white organs will be drawn out through the viscera synchronous hygienic inspection line. Then after cutting-to-halves, showering and re-examination and weighting procedures, the carcasses will be sent to the acid-discharging cabinet. Those pieces having finished discharged the acid, are either put into the market for wholesale or through the cutting department for part meat to be refrigerated and available for sale. ZBHT Slaughtering Machinery Co.,Ltd. manufacturing high-quality Pig slaughter process flow and supply OEM, ODM service according to your personal requirement. 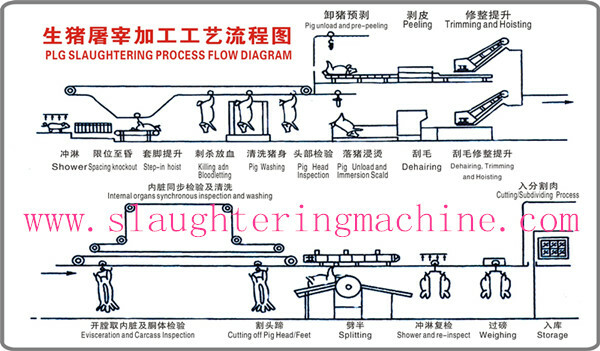 Our Pig slaughter process flow and other Pig Slaughtering Equipment is not only good in quality but also competitive in price, welcome to inquiry us about the details of Pig slaughter process flow or other slaughtering machine products and accessory equipment.